Dr. Stuart Robbins, host of the Exposing PseudoAstronomy Podcast, has over the course of the last month produced three episodes concerning alleged mysteries surrounding Comet Hale Bopp that was visible in 1997. Hale Bopp is unfortunately tied to the mass suicides of the Heaven's Gate religious cult. The three episodes, while all linked together, are designed to also stand alone as each episode considers a different facet of how the comet came to prominence in the popular culture and became connected to the Heaven's Gate deaths. All together the episodes clock in at a tad over 145 minutes. I will refrain from going into detail of each episode other than to point out the broad topics covered by each. The first episode examines how Hale Bopp was discovered, a general history of how comets have been viewed by the public down the ages, and how this comet was of particular note to the public. 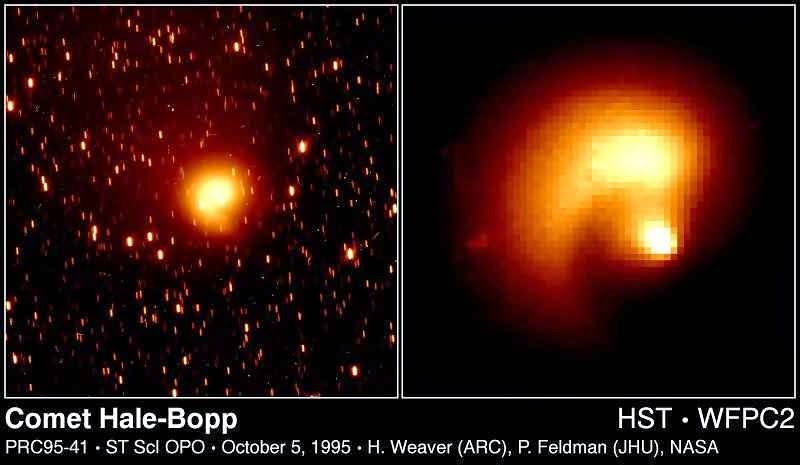 The peculiar notion that Hale Bopp had a companion burst upon the scene when an amateur astronomer contacted Art Bell of the then exceedingly popular Coast to Coast AM late night radio talk show. This astronomer told Bell he viewed an unexpected companion with the comet. Dr. Robbins breaks down this claim, its evidence, and the science that disproves it. The claim ultimately entailed an alleged and unnamed professional astronomer who claimed photographic support of the comet companion claim which was brought forth by Courtney Brown a remote viewer of some popular note. This was followed by the exposing of this 'evidence' of being a likely fraud on Coast to Coast. Believe me, the audio clip of Art Bell losing his cool on the air at the fraudulent photographic evidence is dynamite. The second episode in the arc delves deeper into the photograph supplied by Courtney Brown to support the idea that Hale Bopp had a companion. Apparently, Courtney Brown received through his webmaster, Prudence Calabrese, this photograph from an unknown astronomer from Hawaii. Brown revealed he had this photograph on Coast to Coast as well as his own "remote viewing" findings to support his claims that the comet had a mysterious object with it. ** Dr. Robbins gives a background as to remote viewing, and its shortfalls. He also discusses what Courtney Brown has noted in his defense since his photographic evidence was found to likely be fraudulent. The final episode of the trilogy deals with the events of the Heaven's Gate Cult mass suicide. Dr. Robbins gives a brief history of the cult, explores the connection between the cult and the Coast to Coast popularized notion that the comet had a companion of some sort (probable UFO) with it. The culpability, if any, of Coast to Coast AM to the mass suicide, and finally a discussion of how seemingly innocuous, but weak evidenced belief in such things as a comet trailed by UFOs, can turn ugly. What I enjoyed about this set of episodes is that it goes into some depth on a single topic that can be of use down the line when some questioning soul, skeptically minded or not, can use this as a reference point. One of the frustrating things about podcasts is that generally speaking the topics are covered briefly before moving onto the next topic or panelist. Here is an example of a podcast actually being a resource and not just general information and entertainment. I have no idea if this was Dr. Robbins' goal, but while I would not consider this episode arc the final word on woo woo and Hale Bopp, it is an excellent jumping off point. My only criticism of the arc was I do wish Dr. Robbins went into more detail on the Heaven's Gate cult itself. This is far from a fatal flaw, but while it was very interesting to review the birth, rise, and ultimate dark payoff of a bit of astronomer pseudoscience, the death of the cult members and their thought process deserved a few more minutes of time. Overall, Dr. Robbins produced a very commendable trilogy that covers a topic in a thoughtful and thorough manner. Dr. Robbins gets a rose gold* star. *Apparently, rose gold is all the rage these days. Thanks Apple Watch. **See Dr. Robbins note in comment section. Thanks. I'd just note two things. The first is a correction: Courtney Brown never said where or who gave the film with the photos to Prudence. Instead, it was revealed that WHOMEVER had supplied or obtained the photos had gotten them from U Hawaii's website. So, UH -> ?? -> Prudence -> Courtney -> Bell & Strieber. Second, I debated a bit on just how much stuff to get into with the cult. There's a fine line, I think, between going into so much detail that it glorifies them in some way. The analogy going through my head the whole time was school shooters and the attention-seeking aspect. That said, maybe I shouldn't have worried about that given how old it is. Okay, two more things: If it's a resource, that's great. More downloads. :) And, it's "Hale Bopp" for your Labels at the bottom of the post.